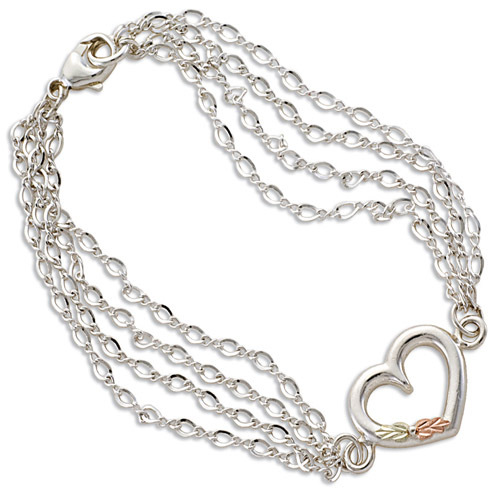 Desc: Landstrom's Black Hills Gold Sterling Silver heart link bracelet. 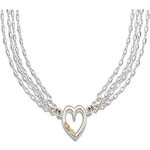 The Sterling Silver heart is mounted in the center and has one rose gold and one green gold leaf mounted. The bracelet consists of four Sterling Silver chains of varying sized links. The clasp is a lobster claw style. The bracelet has a bright polish finish and is made in the United States of America. We have a matching necklace, see GSK497.